The market didn’t respect all the pundits and it didn’t follow the projections that it would be selling at $70/barrel. If it had known, the price would have not slid by more than 8% to end today at a little over $48. Clearly the market has a mind of its own. Faced with large inventories, investors cut the price they were prepared to pay – but that doesn’t mean that diesel prices will quickly follow. 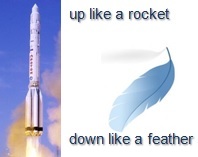 We have talked about diesel-price moves as “up like a rocket and down like a feather”. So, expect diesel prices to very slowly decline! Offsetting the oil cost decline are pressures on both driver employment and the price of new trucks. The number of drivers employed is up and new orders for trucks that were consistently down over the past months are now up substantially.